He was born as the third son of NAKAMURA Yoemon in 1338 and later he changed his name to KIRINO Toshiaki. 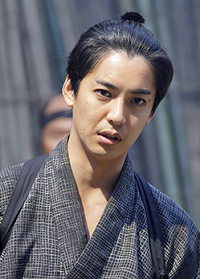 Yoemon was the lowest-class samurai and he was exiled to Tokunoshima and his stipend was taken away. So Hanjirō ans his family made a living by farming. He accompanied SHIMAZU Hisamitsu to Kyoto in 1862 and guarded Prince Asahiko. He was involved in the Teradaya Incident in the same year and was suspended. 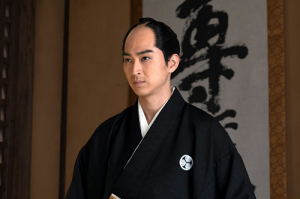 But soon after he joined the group of overthrowing the shogunate and was taken into SAIGŌ Kichinosuke's confidence and supported by KOMATSU Tatewaki. He was called "Hito-kiri Hanjirō" (Hanjirō the killer) at that time but killed only one man who supported the shogunate. On the other hand, he acted as spy and got to know KATSURA Kogorō, SAKAMOTO Ryōma and NAKAOKA Shintarō. He is sais that he accompanied Kichinosuke when he talked with KATSU Kaishū about the surrender of Edo Castle. Aftet Taisei Hōkan, the Battle of Toba-Fushimi and the Boshin War occurred. He participated in some battles and finally fought in Aizu. When his side took Wakamatsu Castle in September 1868, he was charged with the handing over of the castle and sympathised with his enemies. In the new government, he was promoted to major general of army. However, when Kichinosuke (Takamori) resigned from his public post, he accompanied him and returned to Kagoshima. He helped Kichinosuke establishment Shigakkō, a school for boys and he taught them reclamation that he did in his childhood. In 1877, the plot to assassinate Kichinosuke by NAKAHARA Nao-o, a police inspector of Tokyo Metropolitan Department was detected. Then he insisted to fight against the government and he was told to procure armaments. This is the Satsuma rebellion (Seinan Sensō). Though he fought until the end of the rebellion, but Mt. Shiroyama where the soldiers of Kichinosuke barricaded themselves were sieged by their enemy. Kichinosuke committed hara-kiri and he was shot through the forehead. He was 40 years old. BEPPU Shinsuke who also supported Kichinosuke until his death was his cousin. During the Boshin War, a member of Shōgi-tai called SUZUKI Hayato cut off his some fingers. Shōgi-tai was defeated by the New government army at the Battle of Ueno. He was said to have loved perfume. In this series, he was a poor boy but skilled in swordplay. After he grows up, he meets Kichinosuke again and becomes his right-hand man. He is appointed to the first major general of army and cast in his lot with Kichinosuke. Yes, I think it's too early to introduce a Christmas carol. But the 28th of September is the day when King Wenceslas (Vaclav I, Duke of Bohemia) was martyred. The carol is well-known in Japan also. The scene in which he and his page bring gifts to a poor farmer's family is impressive. The version is arranged by the Irish Rovers. He was a British doctor in the middle of the 19th century. 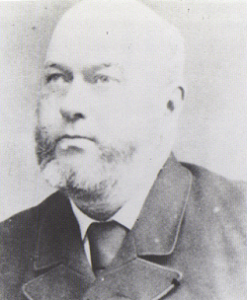 He came to Japan in 1862 as a doctor of the British Embassy of Japan and cured the three British persons who were wounded in the Namamugi Incident. And e held an inquest over Charles Lennox Richardson. He also cured the British soldiers in the Satsuma Bombardment. Later he was appointed to the chief of staff of the embassy while working as doctor. In the Battle of Toba-Fushimi and the Boshin War, he cured many wounded soldiers of both armies, the New government army and that of the shogunate. He brought philanthropy by his medical act. He interacted with Sir Harry Parkes and Sir Ernest Mason Satow. And he contributed to the Faculties of medicine of Tokyo University and Kagoshima University. He also made efforts to spread preventive medicine and public health. Later he brought modern medicine to Thailand called Siam at that time also. He was from Northern Ireland and studied medicine at Edinburgh University. He weighed 127 kilogrammes (about 280 pounds, 20 stone) though Dr. Willis in "Segodon" is slender. TOKUGAWA Yoshinobu escapes from Kyoto to Osaka and dispatches his troops to Kyoto. They meet the army of the new government in Toba and Fushimi on the 2nd of January, 1868 and fight against their enemy that is smaller than them. ŌKUBO Ichizō tells IWAKURA Tomomi about it and he tells him to raise the Imperial standards made by O-Yū and other women. The standards made the shogunal army lose fighting spirit. Kichinosuke commands the army to chase them to Osaka but Shingo is shot by one of the enemy soldiers. He is badly wounded and carried to Shokokuji Temple, the headquarter of the Satsuma Army. O-Tora hopes Kichinosuke will return to there but Kohei says he's still in the battlefield. And TOKUGAWA Yoshinobu who learns the defeat of his army are asked by soldiers to command at the front of the battle. At that time, Tsu domain army betrayed the shogunal army so Kichinosuke who holds a war council is encouraged to visit his wounded brother. But he refuses it and says he should cast aside personal feelings now. And Yoshinobu is informed the betrayal of Tsu domain and some soldiers hesitate to fight against the army with the imperial standards. He is requested to hold a castle and he accepts it. "I will fight against them! Follow me, everybody!" However, on the 6th of January 1868, he, his close advisers and Fuki went out of the castle secretly and the news is brought to Kichinosuke. Thus the war substantially ended in the victory of the new government army. 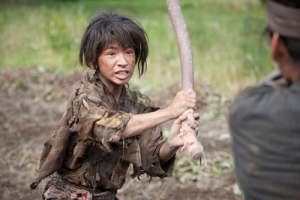 The condition of Shingo's wound gets worse and Kohei and O-Tora worry about it. But Kichinosuke intends to go to Kyoto to obtain the Imperial sanction of subjecting Yoshinobu. At the same time, Yoshinobu and his party go toward Edo by Kaiyō-maru, warship of the shogunate. In the ship tossed about by heavy seas, Fuki says that Both Yoshinobu and she are punished with a laugh. She also says those in the ship will be drowned at sea and it irritates Yoshinobu. When they return to Edo, KATSU Kaishū visits them suddenly and speaks bluntly that he should take responsibility for the defeat and dishonouring the name of Tokugawa. And Fuki tells him that he did nothing but only escaped from Kichinosuke and he should apologise him. Her words irritates him again so he tells her to go out. "What a poor fellow you are,"
In Kyoto, Ichiz takes a British doctor called William Willis to Shōkokuji Temple. Though the people present are surprised with the foreigner, he says that he is a doctor in Japanese and performs surgeries of the wounded soldiers includes Shingo. when he becomes conscious, Ichizō tells him that Kichinosuke obtained the Imperical sanction of subjecting Yoshinobu. 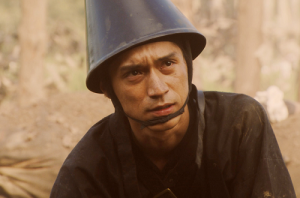 Though Shingo thinks his brother behaves like a devil, it's kichinocuke who laid the groundwork to invite Willis to Kyoto to cure the wounded soldiers. Besides he appealed it to the Emperor directly (*). When February comes, Kichinosuke goes to Edo to subject Yoshinobu and Shingo accompanies him. Though he has not recovered completely, he hopes to witness his brother's determination. At the headquarter of the grand government general in Sunpu (**), Prince Taruhito of Arisugawa who is the general receives the letters from the chief abbot of the Kan-eiji Temple (***) and TOKUGAEWA Yoshikatsu, lors of Owari domain. They say that the advance of the new government army should be stopped. And Seikan-in-no-miya (Kazu-no-miya) writes him that Yoshinobu confines himself in Kan-eiji Temple and swears allegiance to the Emperor. 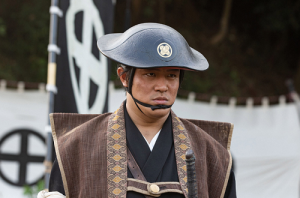 However, Kichinocuke insists the army should continue advancing and if Yoshinobu really swears allegiance to the Emperor, he should transfer the shogunal weapons, bullets and ships to the new government and surrender himself to them to die if necessary. As he calls the letter of Seikan-in-no-miya just a piece of paper, he is blamed for the disrespect. 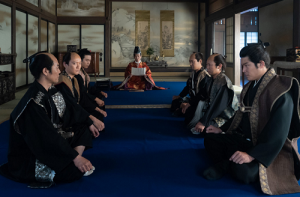 But he objects that marching to Edo is the order of the Emperor and it's decided that the New government army will launch an all-out attack on Edo on the 15th of March. Kaishū visits Yoshinobu in Kan‐eiji Temple and tells him that the New government army is marching to Kantō region. Yoshinobu says he cannot move until he is pardoned but Kaishū says that the army is looking for the chance of killing him. He encourages him to fight against them but Yoshinobu says if he does so, Japan will be invaded by foreign countries. Kaishū asks him why he says so is because of the writing of his father Tokugawa Nariaki, as the writing "Son Jō" (shortened form of Sonnō Jōi, respecting the emperor and expelling foreigner) is hung on in front of him. Then Kaishū sends YAMAOKA Tesshū, former vassal of the shogunate to Sunpu. He introduces himself confidently at the entrance of the headquarter and hands Kaishu's letter to Kichinosuke. 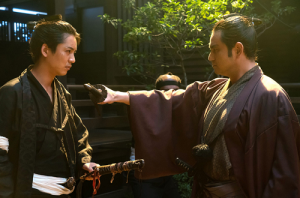 He says Yoshinobu is really loyal to the Emperor and if Kichinocuke attacks Edo, he is forced to fight against Kaishū. But Kichinocuke never changes his idea. "If a samurai cannot trust his master, he will not be a samurai any more". He realises how Tesshū feels and makes the troop stop advancing. And he and his staff goes to Edo antecedent to the army. They enter a restaurant and see that they are so feared because their attack is rumoured here and there. Then an elderly woman in front of them. 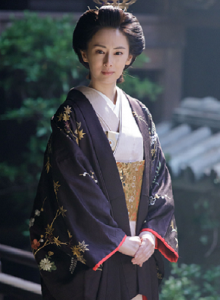 she is Ikushima who visited the residence of Satsuma domain to meet him and is told where he is. Then Kichinosuke disguises himself as a guard and enters Edo Castle. He meets Atsu hime, who is called Tsnshō-in now for the first time in 12 years. (*) Such behaviour was or still is regarded to be impolite. (**) The capital of Suruga, eastern part of current Shizuoka and the place originally associated with the Tokugawa clan. (***) Most of the chief abbots of the temple were from the Imperial family. The images are from the official website of "Segodon". copyright © 2018 ベイカー寮221B／Baker House 221B all rights reserved.